Related Food for Thought on The Kitchen Table Blog: Lesson Learned? 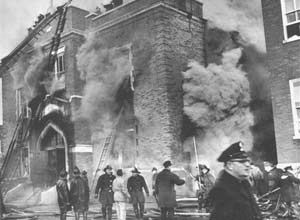 In this Dec. 1, 1958 photo, fire fighters battle the blaze at the Our Lady of the Angels School in Chicago that killed 92 students and 3 teaching nuns. "But what does a third-grader know?" recalled Taglia, now of Katy, Texas. On the first floor at Our Lady of the Angels School, where Mary Ellen Hobik was taking an English test, the nun in charge of her fourth-grade class dismissed the alarm as a mistake. "I was glad, because I knew I was doing well on the test," said the current Mary Ellen Reeves, now an elementary school principal in Addison, Ill. But the alarm was real, and fire and toxic smoke engulfed the elementary and middle school on Chicago's West Side with terrifying swiftness. Three nuns and 92 students died. Some burned to death. Others died of smoke inhalation or were trampled. Still others died when they jumped or were pushed or thrown from windows. The disaster threw the city into mourning and brought messages of condolence from around the world, including from Pope John XXIII and West German Chancellor Konrad Adenauer. It brought about an almost immediate reform of school building and safety codes in Chicago and around the nation. And it left deep physical and emotional scars that remain 50 years later. By the time the alarm rang, heat already was shattering the glass transoms over classroom doors, letting in a deadly mixture of smoke and gas. The fire had invaded the attic space above the second-floor rooms, dropping burning ceiling tiles onto the students below. Smoke and superheated air made the second-floor hallways impassable and for many the only escape was through the windows — 25 feet above the paved school yard. Horrified neighbors came running with ladders, but they were too short. In Room 209, 13-year-old Gerry Andreoli followed the orders of Sister Mary Davidis Devine to stuff textbooks into the cracks around the door, but the air soon became unbreathable. Andreoli climbed to a windowsill and jumped to the top rung of a ladder two feet below. The skin had burned off his hands, so he skidded down the ladder on his back, catching the rungs with his heels. "I don't know now how I did it," said Andreoli, now a chiropractor in Bloomingdale, Ill.
Across the hall in Room 210, Irene Mordarski couldn't reach the ladder. An explosive blast of air knocked her off the windowsill, and the 13-year-old fell to the pavement, shattering her pelvis. Someone ran to a shop across the street to phone the Fire Department, but they mistakenly gave the wrong address. Once fire fighters arrived with hoses and longer ladders, they had to reach as far as they could into the burning classrooms, grab children and toss them down — hoping someone below would catch them. Kathleen Guisinger, of Mountain Home, Ark., says she is still haunted by what she saw that afternoon. She and her sister and brother escaped safely, but two of their cousins died. "Just think of it," said Guisinger, now 60. "You send your healthy child off to school and you never see them again. I can't comprehend that, and yet I saw it happen." In retrospect, conditions at the school appear to have been a disaster waiting to happen. It was in the midst of the Baby Boom, when classroom overcrowding was the national norm, school construction was largely unregulated and safety features were primitive, at best. The students at Our Lady of the Angels were returning from their Thanksgiving break that Monday morning. Some were absent because of colds and flu, but more than 1,400 filed into the main building. Another 200 went to an annex for the youngest pupils. OLA, as it was called by the students, had been built in stages beginning in 1904. By 1958, there were two large, two-story wings connected by the annex. The exterior was brick, but floors were highly varnished wood and narrow wooden stairs were covered with asphalt tile. "Varnished wood with years worth of wax residue, wooden stairs with flammable tiles ... they may just as well have built it out of tinder and kindling wood," said one survivor, Lt. Michael Mason of the Downers Grove Fire Department, who was a 6-year-old first-grader at the time of the fire. The construction would be unthinkable today but was completely legal under grandfather clauses in Chicago's school building code of the time. Investigators determined that the fire started in a trash barrel in the basement. It smoldered for a half-hour or more until the heat shattered a nearby window, letting in fresh air. Flames quickly spread to a stairway. The first-floor door kept it away from the classrooms there, but the fire spread unchecked into the second floor and the attic. There was just one steel fire escape — and it was locked. The fire alarm was not connected to the Chicago Fire Department's system, and its switches were six feet off the floor — too high for most students to reach. Later, investigators said there were signs the fire had been set, either accidentally or deliberately. Three years later, police in suburban Cicero arrested a 13-year-old for a series of arson fires and discovered that he was a former OLA student. Under intense questioning, he admitted setting the school fire, but later recanted. He was never charged, and has since died. In the year after the fire, 16,500 older school buildings across the nation underwent various forms of fireproofing, and the National Fire Protection Association estimates that 68 percent of U.S. communities followed Chicago's lead in adopting new school fire codes. Andreoli, who required 14 skin grafts, wasn't released from St. Anne's Hospital until March 1959. That's when he learned his girlfriend, Beverly Burda, had died. "Those days were like the Dark Ages — they tried to keep you in the dark," he said. "Nobody told you anything about the fire or what happened. And because my face was burned they wouldn't even let me have a mirror." At St. Anne's, he met Irene Mordarski. She spent 7 1/2 months in St. Anne's and had undergone the first of a number of hip replacements. They eventually dated — awkwardly at first, because fear forced them to sit only by doors and exits at restaurants and theaters. They married in 1967 at Our Lady of the Angels Church. Some survivors complain about the policy of silence, and about the simplistic tone church officials took in consoling the families of the dead children. Several remember a priest at a Christmas service saying: "Baby Jesus really wanted to have a great birthday party, so he gathered those special children around him." "Saying that God took the good and innocent children is a wonderful way to make those who were grieving feel OK," said Taglia. "But it makes the kids who survived think `What am I, (expletive)?'" Taglia's two sisters also attended the school, and when his mother heard the mounting death toll on her car radio while returning home from work, she assumed at least one of her children had died. "We were all safe and Danny was already sitting at the kitchen table having cocoa when she pulled up," recalled his older sister, Joanne Franzone, of Sheridan, Ill. "She locked herself in the car and kept yelling 'Which one?' We all had to come out on the porch and show we were safe before she would open the car door." "We all felt awful for months," Franzone said. "There was so much guilt."